Am I right in understanding that only the player who played this support can trigger its action? The one controlling it to be more exact, but yes, usually the player that played it. Danigral - 2 out of 5. This can be awesome for rushing stories if you have the cards to hemorrhage. Or to make the story more threatening when your opponent attacks. But again, it’s only at one story and it goes away. mnBroncos - 3 out of 5. I am giving this a 3 because although it isn’t great this will be a very strong card in the right deck. Can see teaming up with MU to add investigation, Agency for Combat, Hastur for Terror and more. Not to mention you may never trigger it just your opponent has to respect it. Obtuse - 3 out of 5. Better than you think it is, but not as good as you want it to be? If you’ve got cards in hand you have the potential to be dangerous at a story with this. Cool art. livingend - 2 out of 5. The effect is awesome, but, unfortunately, so is the price it comes at. Discarding a Stalking Hound for an additional combat struggle at a story with Monsieur Lindquist is obviously the best case scenario here. Outside of artificially crafted circumstances however, Deciphered Reality is straight card disadvantage for a minor effect in a faction that doesn’t excel at terror or combat struggles. Verdict: Maybe in a dedicated rush deck? Wherever it may go, it’s definitely gonna be a deck that either doesn’t care about cards or draws like crazy. WWDrakey & Ire - 2 out of 5. Kinda tempting in its own way, but the end price for a single additional struggle just ends up being too high compared to the going market price. Still, somewhat better than the Shub-one, despite ending up with the same rating, due to providing some interesting flexibility and making your opponent do a lot more math for the story. Hand discards can be attractive in order to activate T'tka Halot. Deciphered Reality is brutally inefficient. It doesn't even do anything until you start discarding cards to trigger its ability. Even then, it's only once per turn, and it can only add struggles that already exist at the attached story. It can't even remove struggles, which would have added some welcome versatility. 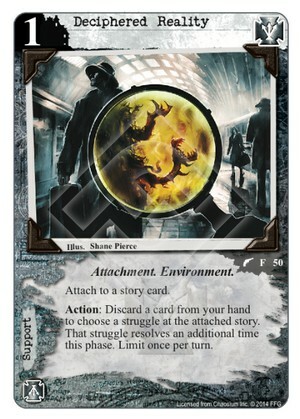 Even running John Scott, Mayor Atkinson, Senator Nathaniel Rhodes, recursion, and so forth, this card just doesn't do enough to warrant a spot in my decks. It's too slow and temporary to effectively seed a discard pile, and trading a card for one extra struggle is just a bad trade. The fact that this card exists automatically saves Unbound! from being a 1/5 because Deciphered Reality creates a new standard for 1-star cards in my opinion. Too bad because I like the art and the concept.